Homage to B. Franklin is an interactive sound installation created and developed at Estudio Lumen. In 1761, fascinated by glass harps, Benjamin Franklin invented the glass harmonica, an instrument which despite having attracted the attention of big names like Mozart, Strauss, Beethoven, Donizetti and Goethe, was misunderstood and doomed to oblivion. Like Franklin, we also got inspired by the glass harps, so popular in the eighteenth century and still enjoyed nowadays. 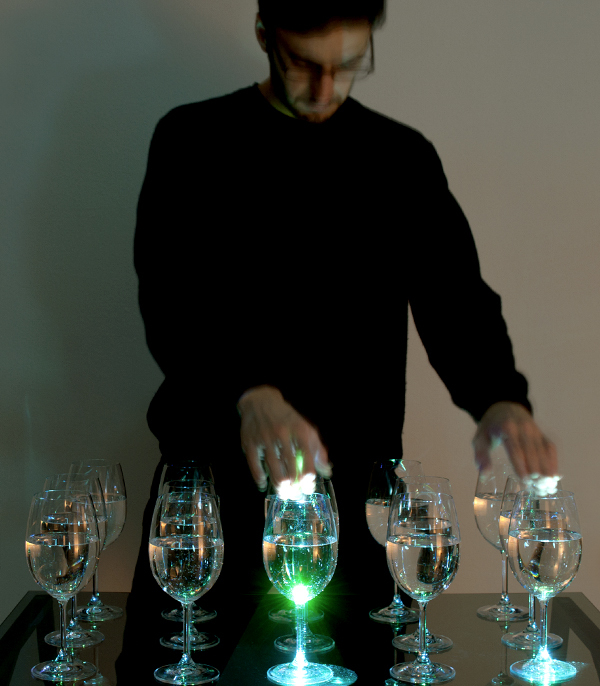 With this reference in mind, we aim to realize a dialogue between the past and the approach to explore sonority from elements of everyday life -like simple crystal glasses filled with water- and the present, in which we use electronic synthesizers and tangible digital interfaces to generate music. In both cases, there is something magical about being able to generate music without necessarily being an instrumentalist, without making use of classical or conventional instruments. In both, the resulting sound is different from what these instruments can generate, but still music. Participation from the audience is essential for this work to make sense. This is not an artwork of mere contemplative character. We are interested in motivating the participation and the dialogue work-individual and between individuals, since this is a project in which one can interact in groups. Through interaction, we can reach new dimensions of sound. Another goal is to help break the myth that technological means may be inaccessible or difficult to understand, and be an instrument of approach making use of an interface known as the glass harps. From the movement of hands over the glasses, it is possible to define new sound patterns. Stimulating the senses, new creative possibilities emerge through the individual experience of each viewer. In that game generated by the representation of something so old, we propose a reinterpretation and a homage to Franklin and his harmonica.